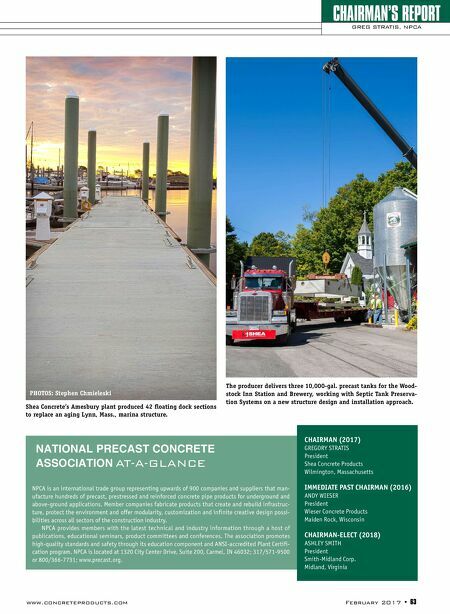 www.concreteproducts.com February 2017 • 63 CHAIRMAN'S REPORT GREG STRATIS, NPCA NATIONAL PRECAST CONCRETE ASSOCIATION AT-A-GLANCE NPCA is an international trade group representing upwards of 900 companies and suppliers that man- ufacture hundreds of precast, prestressed and reinforced concrete pipe products for underground and above-ground applications. Member companies fabricate products that create and rebuild infrastruc- ture, protect the environment and offer modularity, customization and infinite creative design possi- bilities across all sectors of the construction industry. NPCA provides members with the latest technical and industry information through a host of publications, educational seminars, product committees and conferences. The association promotes high-quality standards and safety through its education component and ANSI-accredited Plant Certifi- cation program. NPCA is located at 1320 City Center Drive, Suite 200, Carmel, IN 46032; 317/571-9500 or 800/366-7731; www.precast.org. 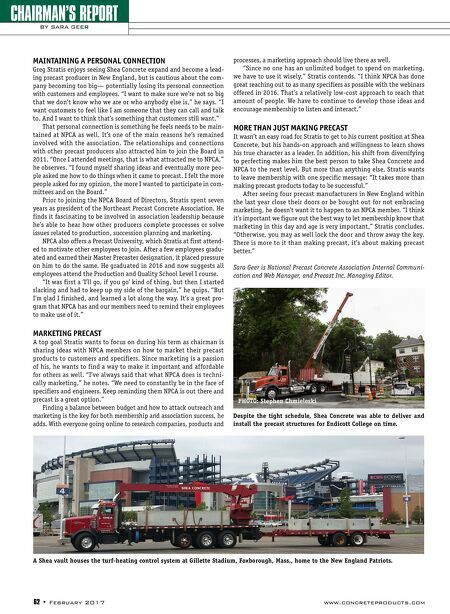 CHAIRMAN (2017) GREGORY STRATIS President Shea Concrete Products Wilmington, Massachusetts IMMEDIATE PAST CHAIRMAN (2016) ANDY WIESER President Wieser Concrete Products Maiden Rock, Wisconsin CHAIRMAN-ELECT (2018) ASHLEY SMITH President Smith-Midland Corp. Midland, Virginia Shea Concrete's Amesbury plant produced 42 floating dock sections to replace an aging Lynn, Mass., marina structure. PHOTOS: Stephen Chmieleski The producer delivers three 10,000-gal. precast tanks for the Wood- stock Inn Station and Brewery, working with Septic Tank Preserva- tion Systems on a new structure design and installation approach.